The Love Boat was a Aaron Spelling sitcom which was set on a West Coast Cruise Ship. It featured a virtual whose who of weekly guest stars usually in some stage of love which would either blossom on the cruise or fall apart because it was wrong from the start. 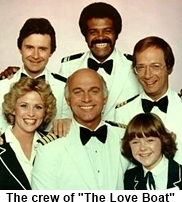 To service the passengers needs is the capable crew starting with Captain Stubing (Gavin MacLeod), the Cruise Director Julie McCoy (Lauren Tewes), the ships physician Doctor Adam Bricker (Bernie Kopell), the Purser Burl ‘Gopher’ Smith (Fred Grandy) and of course the ships chief bartender Isaac Washington (Ted Lange). Captain Stubing’s daughter Vicki (Jill Whelan) joins the cast in season two as a regular. The series utilized the guest-star cast anthology format much like another Aaron Spelling showFantasy Island. 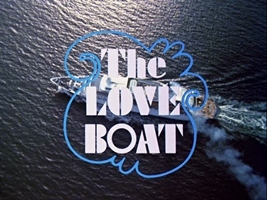 Love Boat helped to launch new careers as well as revitalize some with many famous film stars of yesteryear making rare television appearances. Ratings were consistently top 20 and even top 10 for seven of its nine seasons but eventually the novelty wore off. Rating dropped and the series was canceled at the end of the ninth season. Even after the cancellation however four three-hour specials aired during the 1986–87 television season. 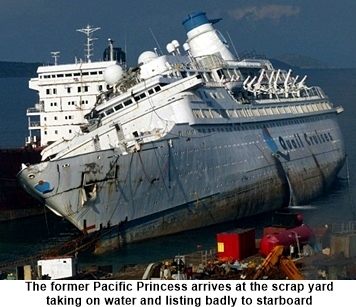 The former Pacific Princess was sold to two different cruise lines before a failed sale to a third line prompted the owners to sell her for scrap in 2013. She was 42 years old, and was decommissioned in 2008. A Turkish company acquired her for 2.5 million Euros ($3.3 million).